I've written about a type of pairing I call a strength-of-schedule pairing. The basic idea is that a team that has had a weak schedule so far (measured by opp. wins, opp. speaks, etc.) gets a strong opponent for the next round. (Of course, all of this is within a bracket, so weak and strong are relative to the average team strength and schedule strength in that bracket.) It sounds simple enough, but it has to work both ways -- both teams get the opponent they deserve in each other. A position along the x-axis shows a team's strength (say, speaker points) above or below the average, 0, of the bracket. 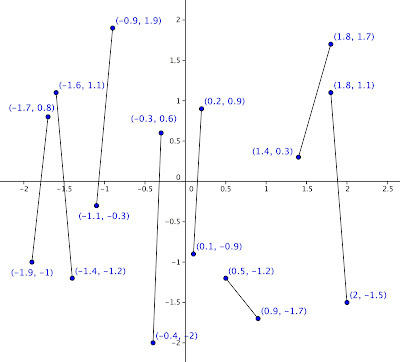 (If it helps, you can think of these as standard deviations above or below the mean; or, you can think of these as speaker points above or below 28.) A position along the y-axis shows a difficulty of a team's schedule above or below the average. Quadrant I contains the good teams in the bracket that have had tough schedules; quadrant IV contains the good teams that have had easy schedules. Ideally, you want debaters from quadrant I (strong teams, strong schedules) to face debaters from quadrant III (weak teams, weak schedules), debaters from quadrant II (weak teams, strong schedules) to face each other, and debaters from quadrant IV (strong teams, weak schedules) to face each other -- to even everything out. Let's look at how the two traditional methods fare. I generated 16 random points on the grid, and based on their scores, power-matched them using these two methods. The best team faces the second best; third, the fourth; on down to the second worst facing the worst. 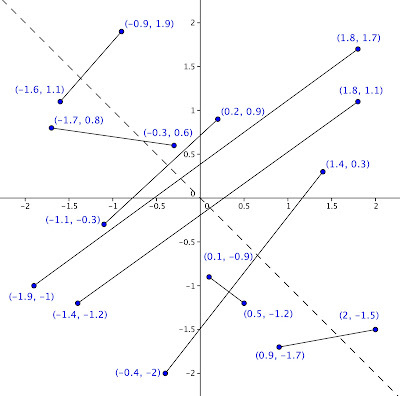 Two debates are matched between quadrants I and IV. These are unfair to quadrant I teams, who are good teams, with tough schedules, facing yet another good team. There are four debates between quadrant II and III. These are unfair to quadrant III teams, who are weak teams, with easy schedules, facing yet another weak team. I'd say there's really only one good match: the quadrant IV team to the other quadrant IV team. All in all, many of these debates are likely to exacerbate the range of schedule strength teams face. Score: 1/8. The best team debates the lowest, then the second best debates the second worst, and so on. This is not much of an improvement in terms of equalizing schedule strength. There are two debates between quadrant I to II -- unfair to quadrant II teams, weak teams, tough schedules, facing another good opponent. There are two debates between quadrant III and IV -- unfair to quadrant IV teams, good teams, easy schedules, facing another weak opponent. 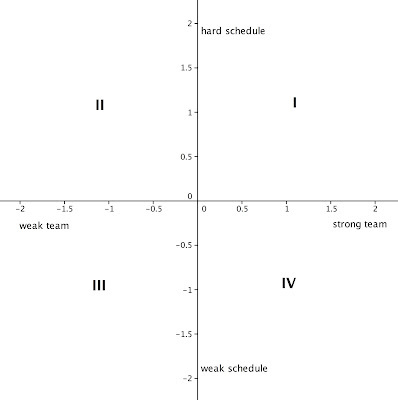 And there are two that are truly wretched: quadrant II (weak teams, tough schedules) to quadrant IV (strong teams, easy schedules) -- unfair to both quadrant II and IV teams!! There are really only two good matches, between quadrant I and III teams. Score: 2/8. I didn't tweak it! This is what came out of my algorithm. All eight matches accord with the preferences I spelled out: Is debate IIIs, IIs debate IIs, and IVs debate IVs. 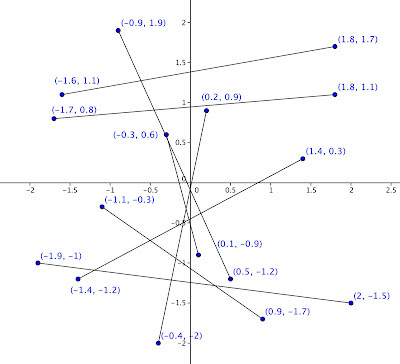 I added in the dotted line to show that most of them have this rough symmetry, where the x score of one is nearly as possible -y of the other, and vice versa. Given the random distribution of the points, it's pretty darn good. All in all, this will equalize as much as possible the schedule strength faced by each team in this bracket. Tough schedule? Weak opponent. Easy schedule? Strong opponent. Score: 8/8. Hey there.. I've been lurking on your blog for a while.. excellent stuff. As you seem to be very interested in logic and debate (and a teacher), I thought I'd give you a heads up about an application I'm developing called Argumentum. It's based on argumentation theory, and on an algorithm I developed for natural argument mapping. You can check it out at http://arg.umentum.com/ or try out the facebook app at http://apps.facebook.com/argumentum/ I'd really appreciate your feedback and any mention on your blog of course. "Ideally, you want debaters from quadrant I (strong teams, strong schedules) to face debaters from quadrant III (weak teams, weak schedules), debaters from quadrant II (weak teams, strong schedules) to face each other, and debaters from quadrant IV (strong teams, weak schedules) to face each other -- to even everything out." It seems like the first two pairing methods you try do poorly by that metric because they simply do not accept it as the ideal way to even things out. "Ideally, you want debaters from quadrants I and II (more oppwins) to face debaters from quadrants III and IV (fewer oppwins) -- to even everything out." it would do poorly, no? Perhaps I'm misunderstanding what this post is getting at. For example, why should teams from II debate other teams from II, rather than debating teams from IV? A common misconception about my idea for strength-of-schedule pairings is that they're no different than normal high-low pairings. At the very least, I wanted to show visually how different high-low, high-high, and s-o-s pairings are. Yes, the sentence you identified, "Ideally, you want debaters from quadrant I (strong teams, strong schedules) to face debaters from quadrant III (weak teams, weak schedules)..." is my own value statement. The reason is that I believe it's the best way to reduce the extremes of variation in opp. wins coming out of the bracket. IIs have had a tough schedule so far, and a IV would be one more strong opponent, whereas another II would be a weaker opponent.